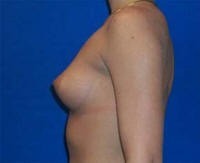 Jay H. Ross, MD: Breast Augmentation Cases 1-20. All the images contained in these albums are from actual patients of Dr. Ross of the Palm Harbor Plastic Surgery Centre. Nothing takes the place of a face-to-face consultation with a board certified plastic surgeon. You can schedule your personal consultation with Dr. Ross now. Note: This site has been setup by The Palm Harbor Plastic Surgery Centre for educational purposes only. Photographs provided forth in this website were taken from actual cases Dr. Ross and Dr. Buck have completed. It is important to remember that results may vary between patients given the uniqueness of each individual’s body. 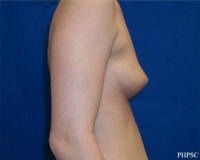 This patient had breast augmentation using saline filled implants from Mentor Worldwide. The implants were inserted through the patient’s axilla (armpits) under her pectoral muscle. The advantage of this method is hidden scar and less tissue manipulation. 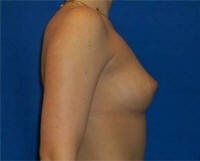 Saline implants will need to be replaced. A 43- year old with a preoperative measurement of 36-B and a postoperative measurement of 36-D. 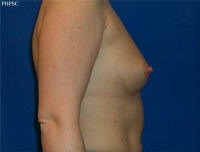 The implants used were round silicone gel, placed through the infra-mammary approach, under the muscle. 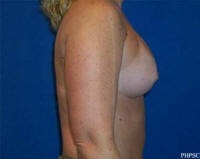 No breast lift was done. A 35- year old with a preoperative measurement of 34-A and a postoperative measurement of 34-C. The implants used were round saline, placed transaxillary (armpit), under the muscle. A 35- year old with a preoperative measurement of 34-A and a postoperative measurement of 34-D. The implants used were round saline, placed transaxillary (armpit), under the muscle. A 46-year old with a preoperative measurement of 34-B and a postoperative measurement of 34-D. The implants used were 400 cc High Profile silicone gel, placed through the infra-mammary incision, under the muscle. A 26-year old with a preoperative measurement of 32-A and a postoperative measurement of 32-C. The implants used were 350 cc High Profile silicone gel, placed through the infra-mammary incision, under the muscle. A 30- year old with a preoperative measurement of 34-A and a postoperative measurement of 34-C. The implants used were round saline, placed transaxillary (armpit), under the muscle. A 40- year old with a preoperative measurement of 36-B and a postoperative measurement of 36-D. The implants used were round saline, placed transaxillary (armpit), under the muscle. A 24- year old with a preoperative measurement of 34-A and a postoperative measurement of 34-C. 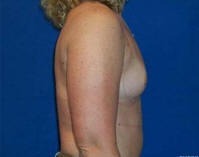 The implants used were round saline, placed transaxillary (armpit), under the muscle. A 32- year old with a preoperative measurement of 34-A and a postoperative measurement of 34-C. The implants used were round saline, placed transaxillary (armpit), under the muscle. A 24- year old with a preoperative measurement of 34-A and a postoperative measurement of 36-D. The implants used were round saline, placed transaxillary (armpit), under the muscle. A 44- year old with a preoperative measurement of 34-A and a postoperative measurement of 36-C. The implants used were round saline, placed transaxillary (armpit), under the muscle. A 25- year old with a preoperative measurement of 34-A and a postoperative measurement of 34-D. The implants used were round saline, placed transaxillary (armpit), under the muscle. A 44- year old with a preoperative measurement of 34-A and a postoperative measurement of 34-C. The implants used were round saline, placed transaxillary (armpit), under the muscle. Consider this approach for a quicker recovery. A 24- year old with a preoperative measurement of 34-A and a postoperative measurement of 36-C. The implants used were round saline, placed transaxillary (armpit), under the muscle. A 28- year old with a preoperative measurement of 34-A and a postoperative measurement of 36-C. The implants used were round saline, placed through the areola, under the muscle. A 34- year old with a preoperative measurement of 34-A and a postoperative measurement of 34-C. The implants used were round saline, placed transaxillary (armpit), under the muscle. A 35- year old with a preoperative measurement of 34-B and a postoperative measurement of 34-D. The implants used were round saline, placed transaxillary (armpit), under the muscle. A 30- year old with a preoperative measurement of 34-A and a postoperative measurement of 34-DD. The implants used were round saline, placed transaxillary (armpit), under the muscle.